My collection of stamps of Afghanistan dates back to the era of Afghan King Muhammad Zahir Shah, who ascended to the throne of Afghanistan in 1933 at the age of 19 after the assassination of his father right in front of him. In the 1960's, he introduced a series of reforms, including a constitutional monarchy and rights for women in voting, schools and the workforce. The moves were not popular with Islamic traditionalists, and in 1973 he was ousted by a cousin while traveling in Italy for eye surgery. He abdicated his throne rather than provoke a bloodshed, and lived a self exiled life in Italy. The postal history of Afghanistan dates back to the 1860s when the Afghan ruler Sher Ali Khan established the postal services in the country. The first stamps appeared in 1871, which were round in shape, imperforate, and printed in black, with a crude tiger's head ("Sher" meaning "lion"), surrounded by Arabic script specifying one of three denominations. The British defeated Sher Ali and brought Abdur Rahman Khan to power in 1880. After independence of Afghanistan from British rule, the first stamp came out on 24 august 1920 featuring the royal star of King Amanullah. The three denominations were also the first to use Latin script for the numerals as well as Arabic. Beginning in 1924, each year at least one stamp was issued in February to commemorate independence, which continued till the 1960s. In 1927, the first Roman letters had appeared on an Afgan stamp, the inscription reading "AFGHAN POSTAGE". This changed to the French "POSTES AFGHANES" in 1928, and remained in that form (with some deviations, as in the 1939 issue) until 1989. 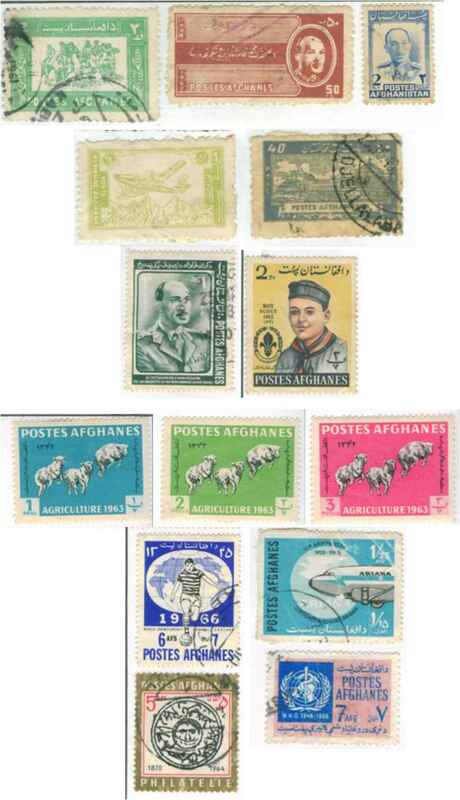 Afghanistan joined the Universal Postal Union in 1928; previously international mail required stamps of British India. The definitive series of 1951 was finely engraved by Waterlow and Sons, and mostly featured portraits ofMohammed Zahir Shah. A large number of Afghan stamps appeared in the 1950s. The issues from 1960 on are not especially notable. Starting in the mid-1980s, many of the issues were clearly produced to sell to Western stamp collectors; for instance, the ship series of 1986 is not especially relevant to a landlocked country. The disruption of governance in the late 80s and early 90s due to civil war and the Taliban, led to stopping of stamp issues from 1989 to 2001, when the Taliban regime was overthrown and the Afghan Postal Authority resumed postal operations. During this period, many unofficial stamps were printed and distributed, which are disavowed by the Afghanistan postal services. The first issue of a postage stamp after the hiatus was the May 2002 stamp showing Ahmad Shah Masoud, a military general and national hero who defended Afghanistan against the Soviet Union in the 1980s and later led a resistance movement against the Taliban.